From the 11/02/2019 we will be closed on Mon, Tues & Wed’s each week and open as normal on Thurs, Fri & Sat, this is to allow me to concentrate on other ventures, sorry for any inconveniences that this may cause, however it is vital for survival. We will be closed on xmas day and boxing day then open on 27,28,29/12/18, then will be closed till 11/01/19. Have a nice xmas & new year. 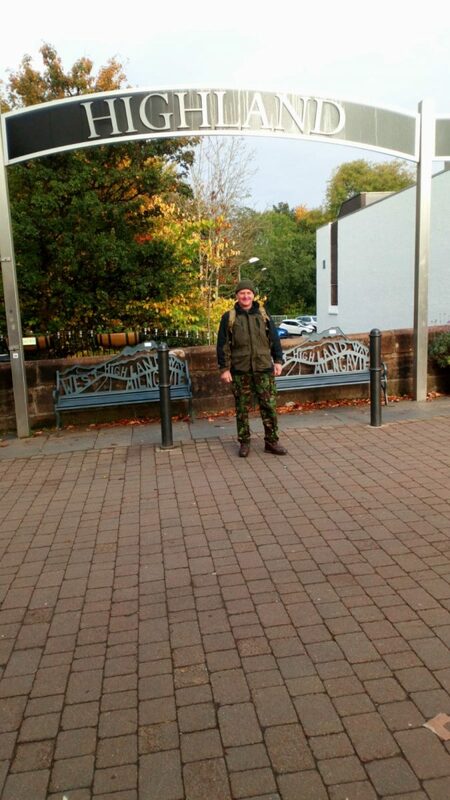 Like the vast majority of people who take on the 96 miles, I walked from South to North. I went with three keen walkers who’d done it before. We started off keen as mustard and I was enjoying the sightseeing. My three pals wanted to power on as they’d done the walk before but I was enjoying (and needing) a slower pace because at five miles in as my feet felt like they were on fire! I was starting to fall behind around this point but was determined to continue, so I stopped to assess the damage and consider my options, after finishing this leg we all met in the Drovers Inn bar for a feed and a couple of beers. SO MUCH RAIN – what a day. I swapped to trainers, hoping that would help my poor feet! I soldiered on and reached the Green Welly Stop in Tyndrum, really needing some new footwear, as my trainers were soaked and I could not stand the thought of putting those Altbergs back on. I was seriously considering a bus to Bridge of Orchy by this point. My feet were hotter than Satan’s radiators and I had 15 miles to go! I bought myself some Sealskinz socks (I was to find out that this would be the best £40 I have EVER spent). I took myself off to the pub for a consolation pint, dried my feet, put on my Sealskinz and back on went the wet trainers. The horizontal rain was off-putting but I had my pint and went on my way. When I arrived and caught up with my mates, they were amazed to see that I was bone dry beneath my army issued Goretex AND my feet were also bone dry underneath the magic socks! The best way to describe this day is wall to wall rain and a Devil’s Staircase to climb – which I was amazed to see mountain bikers descending it. It was miserable! It was a trudge and managed to keep up with my mates for a good bit but despite my miracle socks and trainers combo, my feet were hotter than hell. I was feeling quite scunnered, with surely the world’s sorest feet, so when someone stopped to offer me a lift at the end of the longest, windiest, steepest downhill road ever, I asked them how far away my hotel was – and when they said it was only half a mile to Kinlochleven, I gladly got in the car. Best lift ever! Kinlochleven to Fort William – the end was in sight and this was a good day, despite really changeable weather. This stage faces Ben Nevis – which never seems to be any closer despite how far you walk! 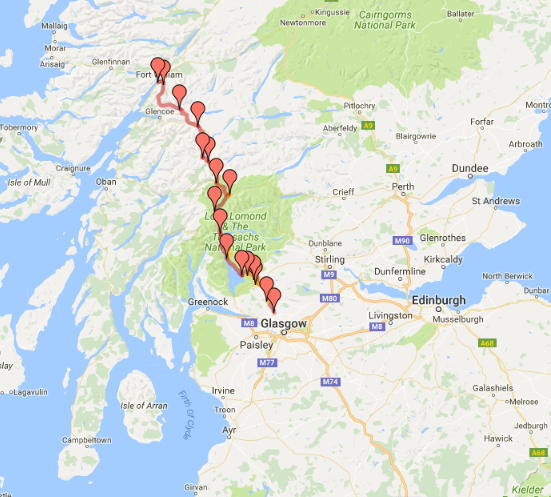 In reaching Fort William – the end – I had an immediate bottle of Baltika in Wetherspoons, where I was informed that my eagerness for a beer meant that I was short of the official finish line by about four metres! I then went straight out and crossed it! The store will be closed from sat 30/9/18 and will re-open on mon 8/10/18, this is for a well-earned holiday, which I have not had for a while, however it will not be much of a break as part of the vacation will be walking the notorious west highland way. Sorry for any inconveniences that this may cause but everyone needs a break now and again. If you’ve ever camped in winter you’ll know it can be cold enough to freeze off certain parts of a brass monkey! 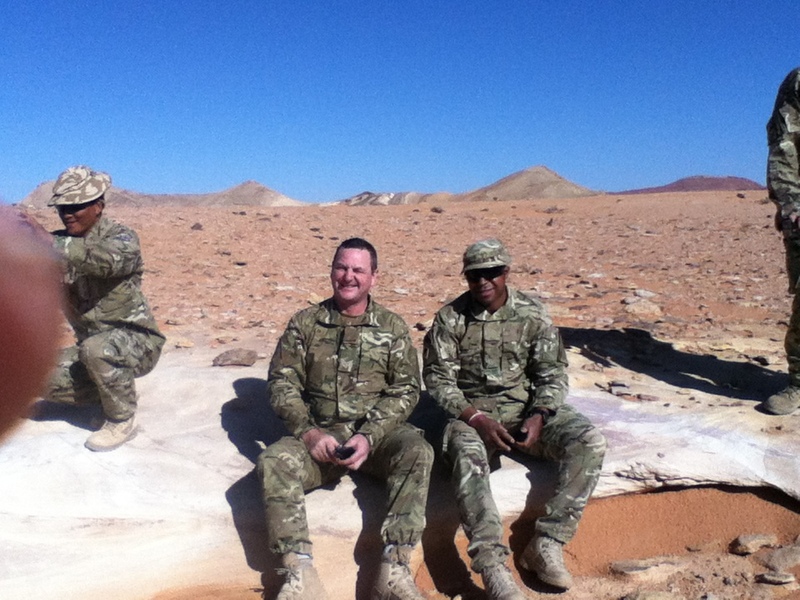 I’m a retired Army Sergeant and I’ve camped in freezing conditions many times. I think the coldest was on a mountain in Canada, where it was -30 and we dug a snow hole to sleep in. I couldn’t feel a thing when I woke up and my fingers struggled to strike the match to light the campfire in the morning. Unless you’re braver than me, you’ll need/want shelter! As soldiers, we often used to set up camp quickly, using a basha shelter. A basha is a bit like a tarpaulin sheet with poles; it is light to carry and can be angled against the elements, however, most people will use a tent. When choosing a tent, you’ll want a lightweight option that is easy to put up and packs down to a size that won’t hold you back. An absolute essential is a good quality Goretex bivi bag, which is waterproof and breathable, such as this army-issued one. A bivi bag goes over your sleeping bag and the reason for this extra layer is that the LAST thing you want is rainwater (or even sweat) beside your skin/clothes and then it freezing! When you are facing an overnight in the bitter cold you need a special cold weather sleeping bag which can keep you warm in sub-zero temperatures. You will not get away with a standard sleeping bag! A few of the friends on our Facebook page suggest putting a layer between you and the ground by either using a sheet of radiator reflector foam or even branches from a fir tree. Another tip was to heat up the inside of your sleeping bag using a hot water bottle before you climb in. I’d also suggest a really warm layer, such as a Softie jacket which is warm, waterproof and take a pair of good gloves, cold weather socks, sturdy boots and a hat, too. Next up, you’ll obviously need food and water. You may not know this, but gas canisters can freeze, so for cooking, I always take a Hexi block cooker, which can be lit with a match or lighter. I also take a decent-sized flask for water, a mess tin, compact cutlery and something boil in the bag to eat. The last wee piece of advice I have for you is to take a head torch. There’s nothing harder than setting up camp in the freezing darkness with one hand! And one last tip from the Facebook page? A hip flask with a single malt! Do you agree with this list? Afterall, not too many of us are lucky enough to have a tipi with a wood burner like one of our good friends on Facebook (you’ll find a pic of his tipi in the comments of this Facebook thread). 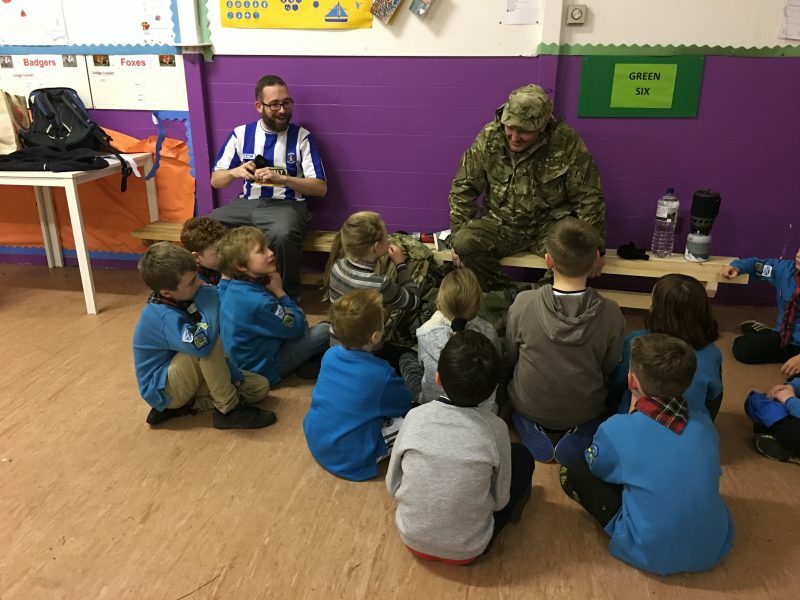 After asking the Beavers what they thought the army is for, I spoke to the kids about what the organisation does, with an emphasis on helping people out in times of crisis, such as natural disasters and keeping the peace. It was a good message to get across as the kids thought that the army “fights the bad guys”. We looked at what a soldier wears, such as webbing, sturdy boots and why we wear camouflage trousers and tops. We also took a look at what a soldier would need to carry in his/her daysack just to keep fed and hydrated for a day. It was lots! 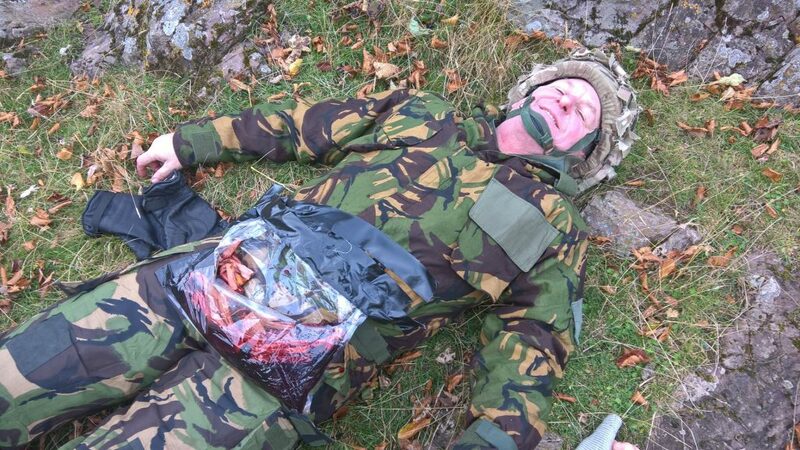 I was able to demonstrate cooking a portion of ration pack bolognese on a wee camping stove, with the help of my nephew Paul who was dressed in a full ghillie suit for a bit of fun. The verdict on the spag bol? 9 out of 12 tasters liked it. Not bad! The kids were also interested in the tube of chocolate for spreading on army-issued biscuits and I left the vacuum-packed nuts for the leaders! I had set up a basha shelter outside the Scout hall and we went outside (it was dark) to check it out. We discussed why they are different from tents and can be arranged into different shapes depending on the area you are in but that it would always be set up to fend against the wind and rain. The kids all took a turn of lying under it, on an army sleeping bag, to see if it is comfortable. They said it was! And we discussed why attaching a glow stick would help to identify or see your basha in the dark. When we came back in from outside, the kids had a turn of marching with the heavy daysack on and agreed it was hard work. Many also wanted to try on the ghillie suit headgear for fun. I was pleased to issue every Beaver with a glow stick for their room – but most of the kids wanted to immediately snap theirs and see it illuminated! Thanks to the leaders for asking me in – and for the beer! If you would like me to speak at your club or at a gathering, please get in touch. 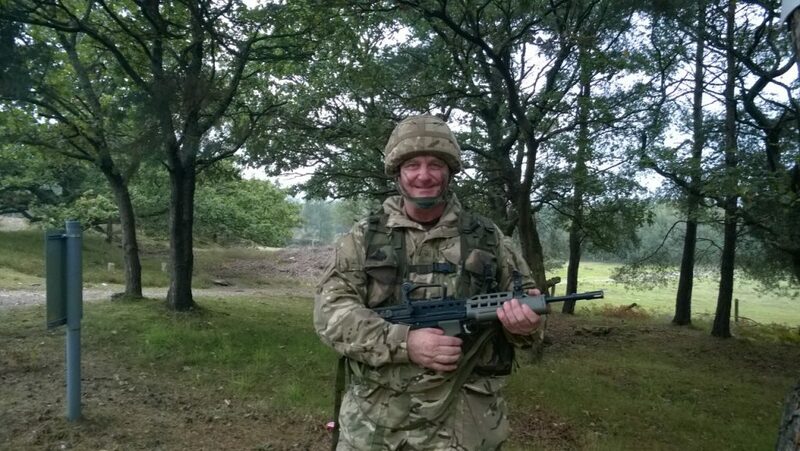 I joined what was then the TA (Territorial Army) when I was in my 30s and I used to make the 5.5 hour trip by car to Grantham every Friday night to do my training over the weekend. 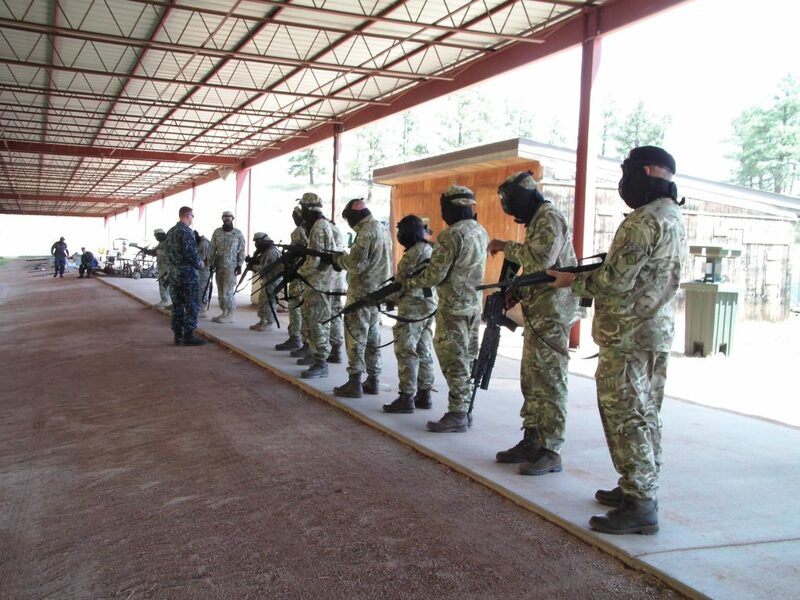 I’d do MATT (military annual training techniques), which would include shooting, battlefield, gas chamber work and first aid – and as MATTs are bounty earning, I had perform them to certain standard to get bounty qualified. 3. followed by a 1.5mile individual run. I’m proud to say that in my 40s, I managed the individual run in 9.5 minutes (for comparison, if I’d been able to keep up this pace, it would be like running a sub 40 minute 10k). A lot of people ask about the training regime but in all honesty it is self-managed; you can do as much exercise as you want to to remain fit – but the fact that you don’t get your tax-free bounty if you fail is incentive enough for anyone to keep in shape. When I started I was issued with my kit. I’d say there are a few things which I could not have done without: body armour, a warm sleeping bag, a Gore-tex bivvy bag, my helmet and webbing (for carrying essentials like water etc); these life-preserving items were to help me when stranded in hostile areas. 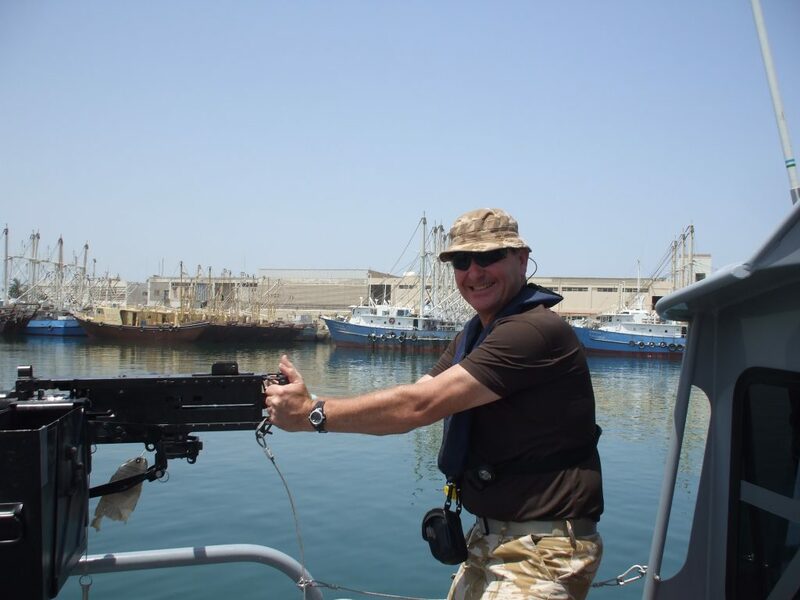 The other essential was an SA80 assault rifle, a standard issue weapon (then and now). I never became involved in heavy weaponry and am glad to say that I never had cause to use my rifle (although I would have if I had needed to). I ended up specialising in logistics, supplying the front line with essentials like food, ammo and water. It’s an important role and I did a lot of training. I remember one logistics exercise, where I drove a truck over 1000 miles from Dundee to Germany, practising loading and unloading simulated ammo with a MAN service vehicle. 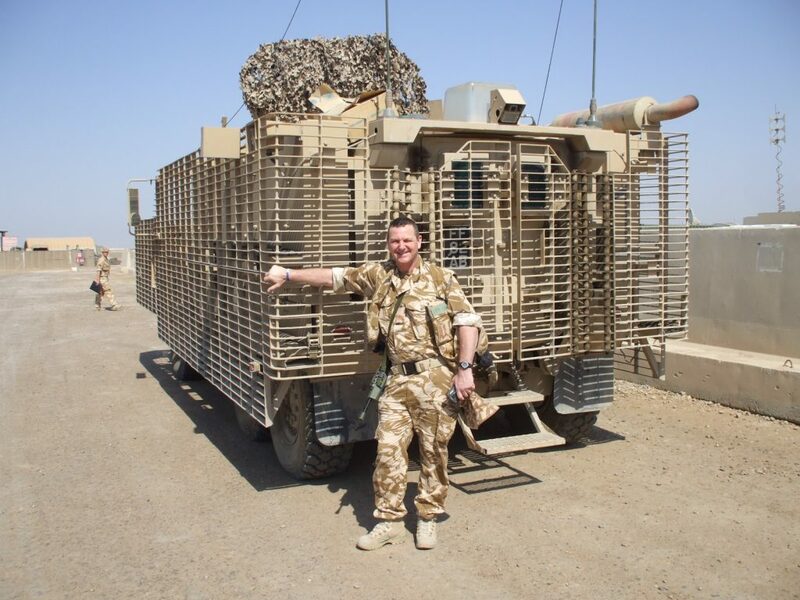 I’ve driven all sorts – from trucks, to Landrovers and DROPs (demountable rack off-load pick up systems) which are for transporting pallets of ammo and also for collecting and delivering smaller vehicles. In my time, I have been to lots of renowned places on the map. In Bosnia and in Kosovo, I felt we were making a difference; I could really see positive changes, as communities integrated and Army welfare programs helped to provide clothes and housing, and relocated displaced families. 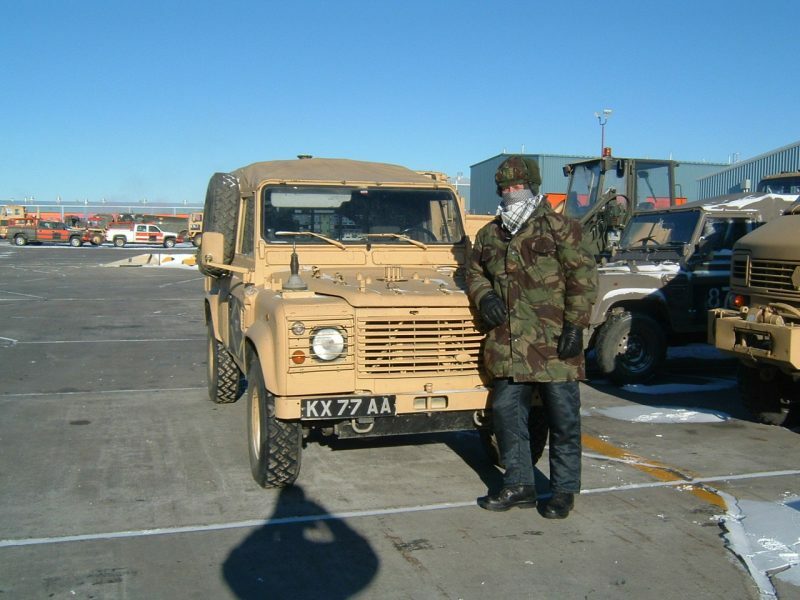 I was based at the Banja Luca Metal Factory in Bosnia and I drove military personnel around in whitefleet 4x4s, making airport runs, mail deliveries, taking people to meetings etc. 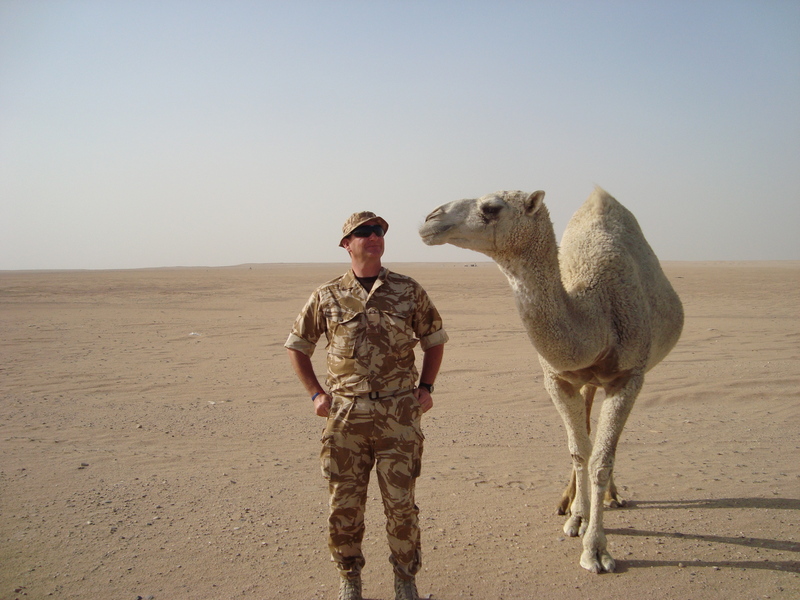 And when I was in Afghanistan in 2010, I can say that I felt well-protected in Camp Bastion, which is like a city. I spent time servicing trucks and armoured vehicles – but it wasn’t safe enough to travel by car out with the city, so we’d travel by helicopter to places such as Kandahar and go on from there. Iraq is probably the one place I felt scared in. I remember the first day, when I was shown my bed! 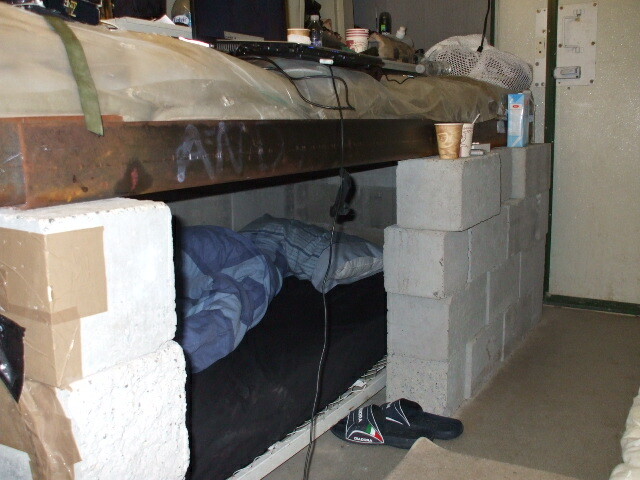 It was essentially a slot big enough for my body and it was built up at the sides with concrete blocks, had a metal ‘lid’ and was surrounded on all sides by sandbags for protection. This was in Basra Airport Camp where insurgents would randomly and regularly fire improvised explosives into the base – and sirens would sound and everyone would drop to the ground to try to dodge the shrapnel. Deafness is a lasting problem for many servicemen and women, caused by the ear-splitting noise. The only place I could take off the body armour was in the accommodation, as the building structure was designed to protect people from shrapnel. Basra was another place where we had to be helicoptered out. But the difference here was that the helicopter used to release a 200 degree decoy flare to quickly get us out of range of the enemy’s heat-seeking missiles. Those journeys weren’t the easiest. I’m proud to have been part of the Tiger Team that managed the assets such as vehicles and containers as they came in via Kuwait. We had a bar code system to show us where items were last tracked and my role extended into the draw down, as we pulled out of both Iraq and Kuwait. What has changed over my time? The immediate thing that springs to mind is all the health and safety changes that there have been. For example, cooking in the field was curtailed for environmental reasons as cooking fat could no longer be dumped. And things like reduced hours driving came in, bringing army personnel restrictions in line with all other HGV driving, where a driver must have a 45 minute break after 4.5 hrs. If anyone was to ask me if they should join the army, I’d say yes! The sense of comradeship is second-to-none and I’ve been places and had some amazing experiences which have made me the person I am today. I’ve enjoyed being fit and full of life and for people considering it, it’s great to know that you can have a great time while you are in the army and also specialise in any area that suits you, gaining life long skills as a ski instructor, HGV driver etc. No other career gives that. I have a training w/e on 7 & 8 jan so unfortunately I will be closed on sat 7th, sorry for any inconvenience. 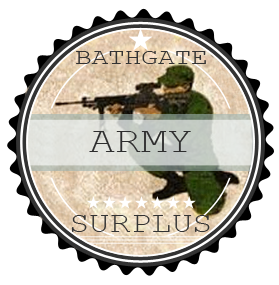 New in, kids military toys, from assault vests, den making kit, gift sets, toy rifles and grenades with sound effect, duvet covers, watches, clocks and much more, check out the products on the site.